A study by a University of Toledo radiologist has found that a 3T MRI is more accurate in detecting breast cancer than the more commonly used mammography and sonography. Results of the findings were published in last month’s issue of the American Journal of Radiology. The objective of the study was to assess the sensitivity and specificity of 3T MRI compared with those of mammography and sonography in the evaluation of breast cancer. In other words, how accurately could the 3T MRI detect disease or abnormality without missing any positive cases, while at the same time not suggesting any false positives? The study also sought to compare the 3T to previous MRI machines. The study was conducted between May 2006 and October 2007 when 434 women at high risk of breast cancer underwent breast MRI, mammography and sonography in the Department of Radiology at The University of Toledo Medical Center. Patients were considered at high risk of breast cancer if they had a personal or strong family history of breast cancer or a positive genetic breast cancer test result. The study results found the 3T MRI is more sensitive than mammography and sonography in the detection of breast cancer and in characterization of small lesions, but it also results in some false-positive results. Specifically, the 3T MRI correctly detected 100 percent of the study’s 66 true malignant lesions compared with 81.8 percent accuracy with mammography and 86.4 percent accuracy with sonography. However, the 3T also suggested 49 masses to be malignant that ended up being confirmed benign by biopsy. Elsamaloty said because use of MRI in detecting breast cancer is relatively new compared to the other methods, its specificity is expected to increase with experience. Compared with previously published results, the study also found the 3T MRI has a higher sensitivity than the 1T and 1.5T versions in the detection of breast cancer with no significant difference in specificity. 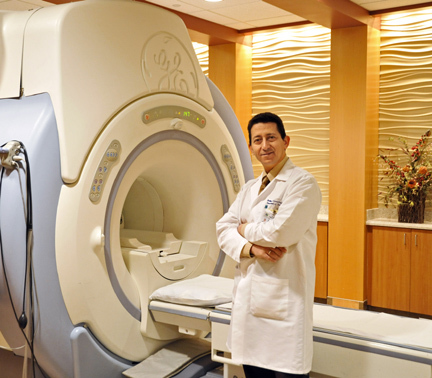 All in all, Elsamaloty believes the study demonstrates that 3T MRI is an important tool in conjunction with mammography and sonography in the detection of breast cancer. Although the 3T MRI is clearly more effective than mammography and sonography, it is currently used primarily for high-risk patients because routine screening remains prohibitively expensive. This entry was posted on Thursday, May 21st, 2009 at 5:05 am and is filed under Research .